You might remember I mentioned these metallic boots in my round up of the best ankle boots for AW14. It all started with a notion in my head that I wanted some bronze boots. Additionally, I was scouring the internet for comfortable boots knowing that my heel wearing would be limited this winter. 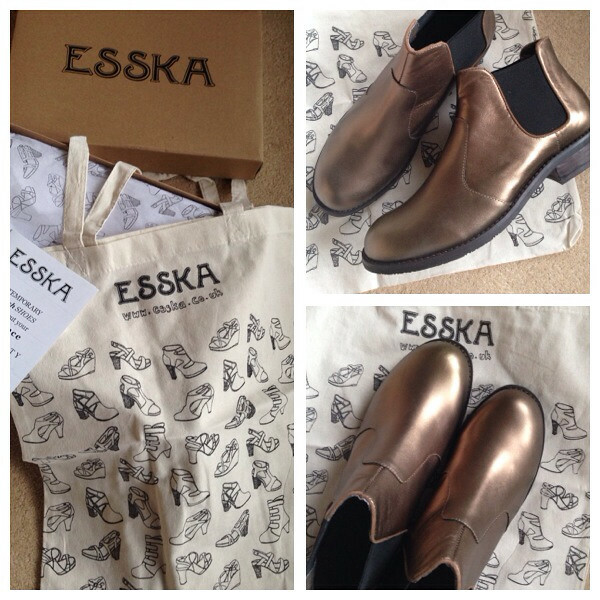 Dina recommended Esska as a great brand for comfort and they had these bronzed beauties new in stock - I love it when a plan comes together. I'm a sucker for an interesting back story also - busy mum who was an architect and retrained as a shoe designer. There was a major tick in the comfort box when I tried them on - supportive but with a bit of a bounce to absorb impact. And the packaging was great too. But how to wear them? Now I will be honest, I struggled with them initially as I thought they stood out too much on me...they felt a bit too shiny. But I did the usual googling and 'pinteresting' thing to get some inspiration..
...and tried them out at home a few different ways and realised that they work best if you go with the bronze/warm tones....leading to this outfit, which I wore the other day. Another addition to my ankle boot collection....in my defence, I didn't keep the M&S pointy ones...but while I'm fessing up, I might have 'acquired' a different pair from elsewhere...more later this week! Agh, I love them! LOVE THEM! WHY did I open this post? Now I have these on my wishlist, dang it! You look awesome and I am really glad they are working for you and your poor feet. Comfort and style, yes, please! Love these Avril. I got a beautiful All Saints pale gold metallic pair in the summer but am struggling to find the courage to wear them! Any ideas welcome. I love these boots! Struggling with the frumpy forty stage of life so think these will go some way to cheering me up! I sadly couldn't resist the pointy m and s boots. Now lookin a dress to wear with them!!!! They look really cool, I have just bought some silver loafers, but hadn't thought of metallics boots. Do you think it's best to keep the rest of the outfit really neutral? Love your hair by the way, great cut! These look fab and go great with the jeans, loving the metallic too! They look great! i too also have a love for ankle boots. I'm obsessed with my anime bing ankle boots!